My dog normally has home made food. As a treat or if I run out I often keep a few cans on hand. I bought this chicken flavour as he usually prefers chicken flavoured cans. My dog turns his nose up at this and will not touch it. I bought a few cans of this flavour and have tried on several occasions and he won’t eat it. Not for my little guy but maybe others will like? 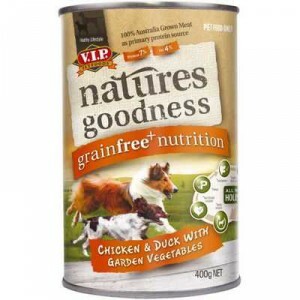 How would you rate Vip Natures Goodness Grainfree Adult Dog Food Chicken & Duck With Vegetables?